Of plagues, of dearths, or seasons’ quality. If from thyself to store thou wouldst convert. Do neutrinos go faster than light? Some physicists think that they might. But according to a statement OPERA began circulating today, two possible problems have now been found with its set-up. As many physicists had speculated might be the case, both are related to the experiment’s pioneering use of Global Positioning System (GPS) signals to synchronize atomic clocks at each end of its neutrino beam. First, the passage of time on the clocks between the arrival of the synchronizing signal has to be interpolated and OPERA now says this may not have been done correctly. Second, there was a possible faulty connection between the GPS signal and the OPERA master clock. We should wait for a more definitive announcement from OPERA about these possible errors, but if it does turn out that technical glitches are responsible for the neutrino speed result then it won’t be entirely unexpected. A faulty cable connection does sound a bit lame, however. I hope they weren’t relying on a USB connection…. Anyway, as I mentioned in a comment elsewhere the arXiv paper from OPERA has now received about 230 citations, although it has not appeared in a refereed journal. If it turns out to have been a completely wrong result, what does that tell you about the use of citations to measure “quality”? The OPERA collaboration has informed its funding agencies and host laboratories that it has identified two possible effects that could have an influence on its neutrino timing measurement. These both require further tests with a short pulsed beam. If confirmed, one would increase the size of the measured effect, the other would diminish it. The first possible effect concerns an oscillator used to provide the time stamps for GPS synchronizations. It could have led to an overestimate of the neutrino’s time of flight. The second concerns the optical fibre connector that brings the external GPS signal to the OPERA master clock, which may not have been functioning correctly when the measurements were taken. If this is the case, it could have led to an underestimate of the time of flight of the neutrinos. The potential extent of these two effects is being studied by the OPERA collaboration. New measurements with short pulsed beams are scheduled for May. I know a few students of Quantum Mechanics read this blog so here’s a little challenge. View the following video segment featuring Sir Brian of Cox and see if you can spot the deliberate (?) mistake contained therein on the subject of the Pauli Exclusion Principle. When you’ve made up your mind, you can take a peek at the objection that’s been exercising armchair physicists around the twittersphere, and also a more technical argument supporting Prof. Cox’s interpretation from a university in the Midlands. UPDATE: 23/2/2012 Meanwhile, over the pond, Sean Carroll is on the case. Adjusts itself to our need. To prove it had ever been there. With white-hot darkness in his eyes. Just time for a quick post this lunchtime, in between meetings and exercise classes. My eye was drawn this morning to an article about a lengthy report from the Institute of Physics that gives an international comparison of citation impact in physics and related fields. According to the IOP website.. 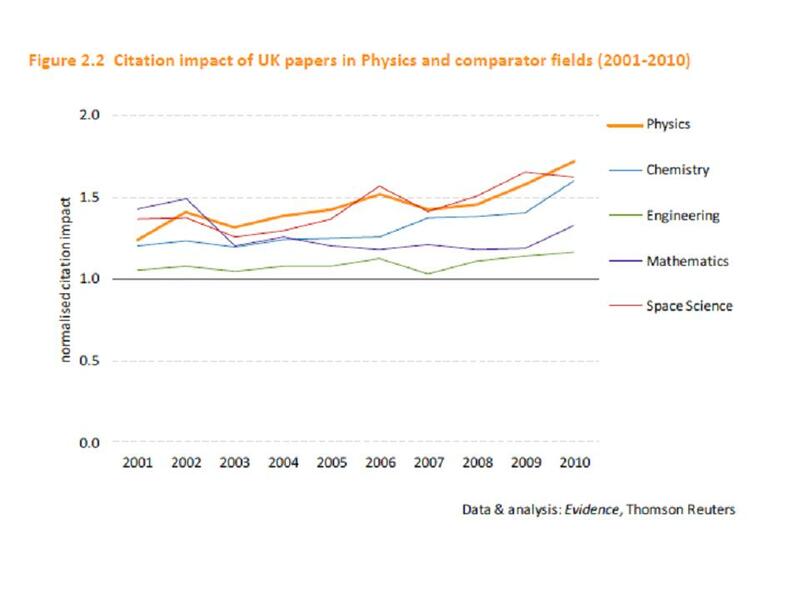 Although the UK is ranked seventh in a list of key competitor countries for the quantity of its physics research output – measured by the number of papers published – the UK is second only to Canada, and now higher than the US, when ranked on the average quality of the UK’s physics research output – measured by the average number of times research papers are cited around world. 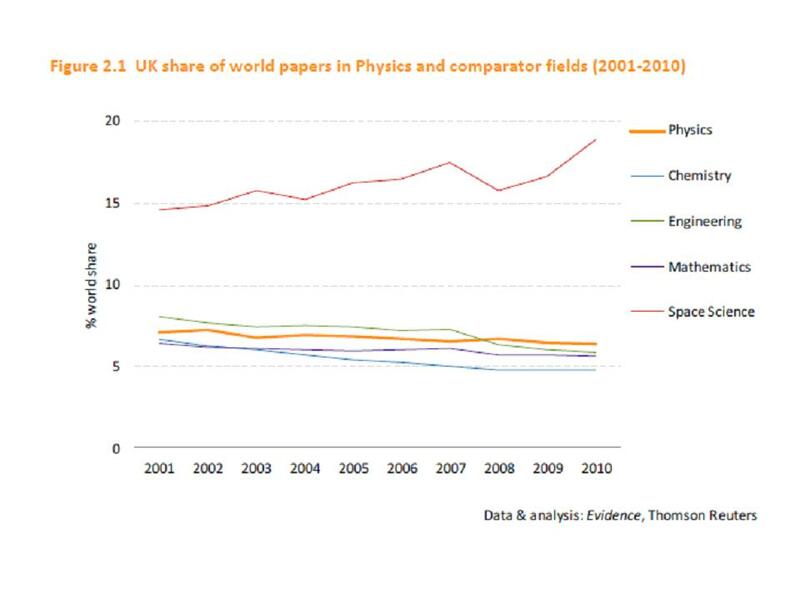 For the UK, however, its proportionate decrease in output – from 7.1% of the world’s physics research in 2001 to 6.4% in 2010 – has been accompanied by a celebratory increase in overall, average quality – with the average number of citations of UK research papers rising from 1.24 in 2001 to 1.72 in 2010. ..apart from the downturn right at the end of the window for space sciences, which, one imagines, might be a result of decisions taken by the management of the Science and Technology Facilities Council over that period. Our political leaders will be tempted to portray the steady increase of citation impact across fields as a sign of improved quality arising from the various research assessment exercises. But I don’t think it’s as simple as that. It seems that many developing countries – especially China – are producing more and more scientific papers. This inevitably drives the UK’s share of world productivity down, because our capacity is not increasing. If anything it’s going down, in fact, owing to recent funding cuts. However, the more papers there are, the more reference lists there are, and the more citations there will be. The increase in citation rates may therefore just be a form of inflation. Here’s an exhilarating little duo featuring alto saxophonist Lou Donaldson and the extraordinarily brilliant pianist Tete Montoliu. Lou Donaldson at times sounds more like Charlie Parker than Charlie Parker ever did, but if you’re going to play bebop there’s no better example to follow. Tete Montoliu on the other hand never sounded like anyone other than himself. He was from Barcelona, by the way, and was born completely blind. The tune, written by drummer Denzil Best, is called Wee although it does have an alternative title, Allen’s Alley; it’s yet another one built around the chord changes of Gershwin’s I Got Rhythm. Anyway, it’s a typically intricate and edgy tune that finds these great musicians at their playful best. The implication seems to be that Dawkins should not be taken seriously because of something that was done by his ancestors almost three hundred years ago. I’m no great admirer of Richard Dawkins. I think he’s the sort of chap that gives us atheists a bad name, advocating a kind of fanatical fundamentalism that I find just as unpalatable as if it had a religious flavour. But, really, is there any need to smear him with the transgressions of his forefathers? Dawkins is reported to have been “speechless” when he heard about the Telegraph story – which I have to admit is no bad thing – but it does strike me as a puerile stunt. There’s probably hardly a family in Britain that hasn’t got a connection with slavery somewhere down the line. It’s a shameful part of our collective past, but it’s no more Richard Dawkins’ fault than any other living person. All I can say is that I hope the Telegraph’s hacks do a similar job digging up the dirt they’ll no doubt find in the history of any number of wealthy families, including those to which prominent members of the Conservative Party belong.